We are a global leader in providing original and quality products, systematically designed for varied industrial purposes. One can count on us for the supply of supreme quality belt tension springs. We are an infallible Belt Tension Supplier, ensuring our product's rigid tolerance and minute specifications. High quality-grade spare parts and raw materials assures the long service life and high durability. These are preferably used in the the railway industry, owing to its strong characteristics, that ensures utter safety and satisfaction. 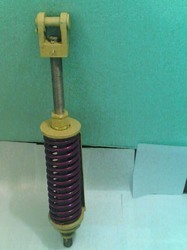 One can avail from us these Belt Tension Springs at highly competitive market prices. Looking for Railways Spring ?